CONDITION : PRE-OWNED (USED) (SEE PICS FOR REFERENCE). Used in Good Working Condition. Minor scuffs and scratches on the front of the device (can't be seen in photos). The multiple award-winning AudioQuest DragonFlys just got a sibling -- the AudioQuest Beetle joins the Digital Critter family of small highly affordable and surprisingly potent devices that make even expensive headphones or whole systems sound a lot better. Condition is Manufacturer refurbished in unopened box. Condition is Used. Free cables included to connect to the computer. Condition is in used condition. Power adapter included. All other buttons perform normally. Remote NOT included but system is still operational without remote and no loss of features. Up for your consideration is a very clean fully functional Mytek Brooklyn Digital DAC in Frosty Silver. Neat little DAC and sounds great. It has a few very minor scratches, (tried to show in the photos), otherwise it is in very nice clean condition. For better sound quality, a Wolfson WM8740 serves as digital-to-analog convertor (DAC), pairing with a high performance operational amplifier from ADI for the DAC circuit. Dual 3.5mm headphone output jack. FiiO Q1 overview. Separate DAC & Amp Functions. Maxim MAX97220 amplifier IC chip. Headphone output. Micro USB port for charging and USB audio connections; may carry on decoding / amplifying while charging. This pre-amp was used as a demo unit in our showroom and has very low hours. 100 kOhms impedance on XLR inputs and 24 kOhms on RCA inputs. Balanced XLR and unbalanced RCA inputs and outputs. Front panel USB for Apple iOS devices. For your consideration is a wonderfulTHETA Digital COBALT 307 digital to analog converter. The Cobalt, based on an off-the-shelf Sony digital filter chip, in comparison with similarly priced alternatives it provided a smoother, less strained, more dynamic sound. NextDrive Spectra 32-bit USB C DAC Headphone Amp. Purchased on Amazon in 7/2018. No longer needed. Used, but in working order. Comes with manual. Stereo integrated amplifier with built-in DAC (Silver). USB DAC Amplifier. 1 pair of analog stereo outputs for connection to a separate amplifier. asynchronous USB (Type B) input for connection to a computer (requires driver download). (Box opened to verify product). DAC chip: AKM AK4452. Crosstalk at 1 kHz, -10 dBFS (3.5mm jack): -102 dB. Length with RCA port: 4.2 in (105.5 mm). Chassis material: Anodized aluminum. Dynamic range, A-weighted: >114 dB. 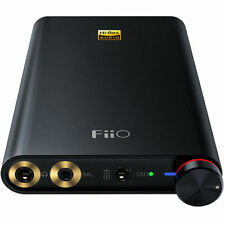 I have a Brand New Sealed FiiO E10K Olympus 2 USB DAC Headphone AMP (Black). This item is brand new, still sealed. The outer packaging might show some light ware, tears in outer plastic. What you see is what you will receive. Thanks! There are both 1/4" and 3.5mm headphone jacks on the front panel. Hookup from an audio source includes and optical input, line ot RCA to speakers, and USB to connect to your computer.There is not a mark or scratch anywhere on this amp. Wolfson DAC with Separate Headphone Amp. Pocket Sized Amplifier Design. Durable Aluminum Enclosure. Sampling Resolution PCM: Max 192 kHz/24-bit. Input Computer/Walkman/Xperia connecting port, iPhone/iPad/iPod connecting port. Onkyo A-9050 Integrated Stereo Amplifiers (Black). Condition is Used but looks new. No scratches. A great amplifier. Dac does not have rubber feet. Sonically: Here's the good news. WOW is this a nice tube. FiiO E10K USB DAC and Headphone Amplifier (Black). Condition is Used. Shipped with USPS First Class Package. About the Niles SI-1230. Cascade bus output: Gold plated RCA stereo output (marked Cascade output) which allows you to daisy chain multiple amplifiers. This output is not buffered so if you want to chain more than 5 amplifiers a buffered distribution amplifier like the Niles ADA-6 is needed. I am the original owner, bought this new in May 2017. Happily used it for about a year before I received another amp I switched over to. I used it for a record player, and music from my phone over bluetooth, but in the pictures you can see the other jacks available. For sale is Oppo HA-1. The unit has been lightly used and works with no issues. 240W 2.0-Ch. integrated Amplifier. Provides clean sound. 0.03% THD (Total Harmonic Distortion). Efficiently conducts power. 8 ohms impedance. Jolida Glass FX DAC Mini Digital to Analog Converter. Condition is New. Shipped with USPS First Class Package. Condition is Used but still mint, standard gain. Sounds terrific, the SDAC is sweet and the O2 is a well regarded high value amplifier design for headphones known to be neutral and engaging. NAD D 3020 v1 Hybrid Digital DAC Amplifier. Sounds great. Headphones output work but R speaker channel does not. If all you need is a headphone amp, this is a steal. Opening price is what a refurbisher would pay, and reflects probable repair costs. Front is glossy black - cosmetically virtually like new (hard to photograph a mirror). Power cord included. Condition is Used. I haven't used in my system since December 2018 but it works well. Resolution Capability: 24bit. A number of our users have been talking about this small and very affordable DAC, which they say can make a digital system sound much better. SMSL M3 USB DAC AMP Multi-function Optical Coaxial Headphone Amplifier Open Box. Shipped with USPS First Class Package. LH Labs Geek Out V2 - Free shipping! If you want to enjoy an optimal home audio experience when it comes to music, movies, and more, eBay wants to help you achieve just that. You'll find a wide selection of audio DAC equipment that converts digital to analog and is appropriate for both speaker and headphones experiences. These components and their accessories are not only affordable but available in new and pre-owned condition. How do you determine DAC compatibility? Be mindful that brand, model, and so forth generally don't matter when it comes to compatibility between a DAC and other home audio components. What does matter is that the components you choose should share the appropriate inputs and outputs, which are generally standardized. If you want to connect a CD player, which delivers a digital signal, to a DAC, then you would want to ensure that at least of the outputs on the CD player matches up to an input on the DAC. How is a DAC typically configured? Home audio setups are highly configurable and can be customized based on your particular equipment. With a typical setup, the DAC will serve as an input for CD players, HTPCs, and other equipment that produces digital audio and will then output to a receiver, amp, preamp, and so forth. Note that some DACs have integrated preamps, amps, and the like. What is a headphone DAC and how is it used? An audio DAC for headphones is an external and standalone device that's designed specifically for headphones as opposed to speakers. These generally connect to a PC or other device via a USB port, and there's often an integrated preamp in order to boost low line levels from the source. In a PC setup, these devices essentially serve as an external sound card, but they can also be used to achieve better sound from a wide range of standalone music players.